I measured. I taped. I stepped on a lost nail weeks later. Then I called Julianne Johnson. Julianne, four-year Visual Associate at Room & Board Seattle, is your everyday design mind-blower and all-around style expert. So when in need of some expert advice on how to style walls, I asked her about frames, shelves and ledges, placement and personalization. 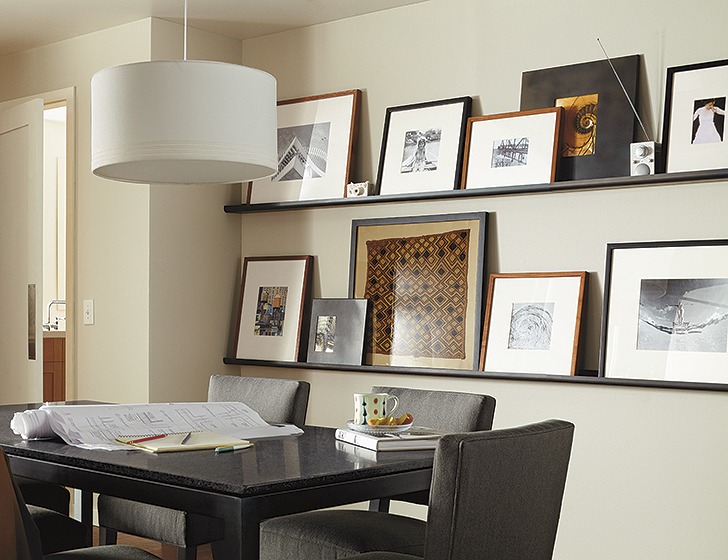 Mantel shelves over Woodwind bookcases creates a modern spot for artwork, photos and more. 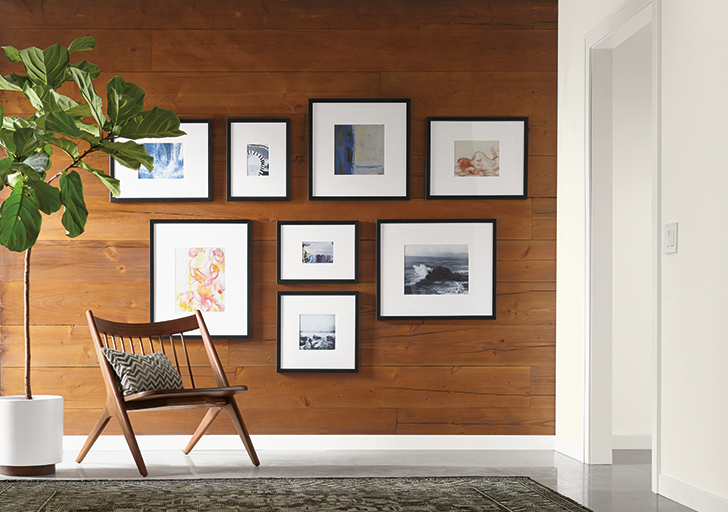 Create an in-home gallery with our black Profile frames. Our Oskar chair with a little greenery gives this space an inviting spot to sit. Our Biblio shelves are available with your choice of white, stainless steel or natural steel brackets paired with either a white, glass or walnut shelf. We love how the Trace shelves mimic the shape of the Easton sectional to create continuity in this living room. The sleek look of the Smith media cabinet is highlighted by an organic arrangement of Manhattan stainless steel frames. 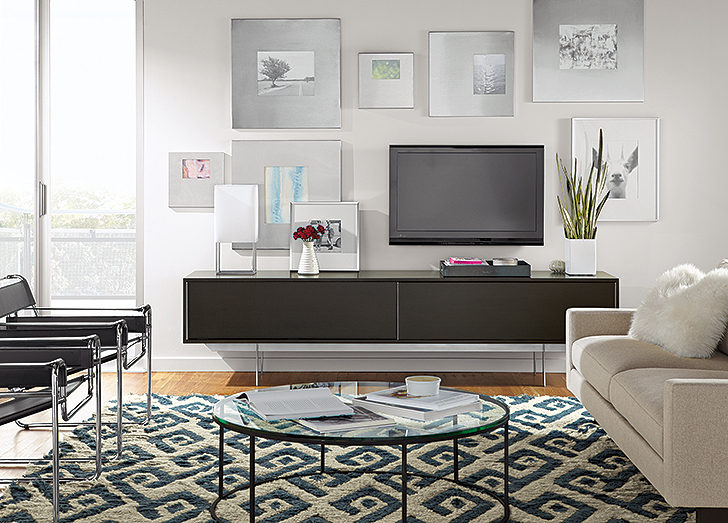 Incorporating a TV into the frame wall adds to the modern appeal. Get the barriers out of the way and find the confidence to play around. Whether that’s mapping frames out on the floor first, or coming into the showroom to get some ideas, you just have to let yourself go. “Our customers are so cool,” says Julianne. “They’re fun and edgy, but grounded.” The same could be said about how she styles walls with shelves, frames and ledges. Trace picture ledges, slightly less deep than Trace shelves, pave the way for a personal grouping of frames that are easy to swap out. Keep the inspiration going and see how other Room & Board customers are styling their walls in our Customer Photo Gallery. 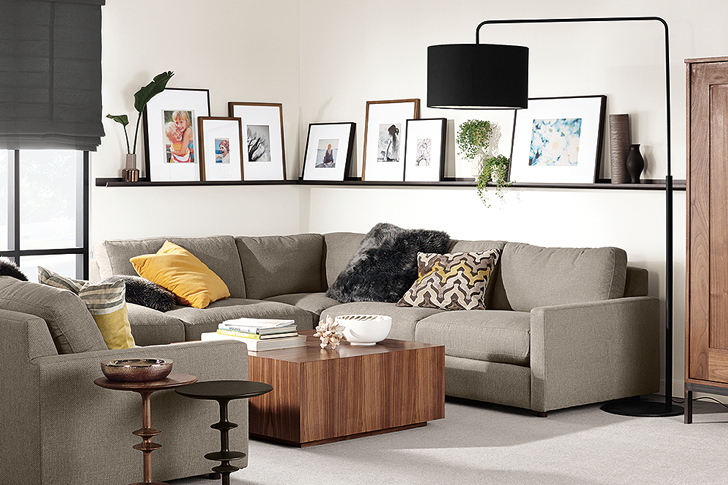 Or take advantage of our free design services – expert advice, floor planning and furniture recommendations are available to you at any Room & Board store, over the phone or at roomandboard.com.